Hei, aurinkoista Roosanauha-päivää! Ensimmäinen takallinen poltettu puita, vähän oli kolea aamu.! Perjantain kortiksi löytyi jälleen nuoripari! Jatketaan vielä muutamalla kortilla ennenkuin vaihdetaan "pukkiperjantaiksi"! Hi, frosty morning again, but sun is shining, woods burning in a fireplace - and coffee mug ! Time for a Friday couple.Lovely Lili of the Valley's stamp, coloured with ProMarkers. Papers are Penny Black's, text " for you 2". I have made this for one sketch challenge, but was late to post it, so here it is! This is so cute! Love the stamp! Beautiful card. Great color combination and adorable image. Thanks for joining the Crafting With An Attitude challenge. Gorgeous card, I love the image and beautiful colours. 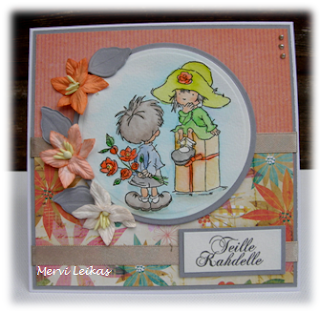 Adorable image, lovely colours and design, a very pretty card Mervi. Thanks for joining The Southern Girls for our Celebrations challenge. One can't but love these cute LOTV images. It's a lovely card for a couple.